In Stock, Will Ship On 04/24/2019. Unlike standard lid O rings which have a .280" cross section, our exclusive Oversize O Ring has a slightly larger (.310") diameter, and is molded from softer rubber, for a more positive seal at low dispensing pressures. An ideal fix for an older keg with a leaky lid, or for any keg that needs to be pressurized before filling to achieve an airtight seal. 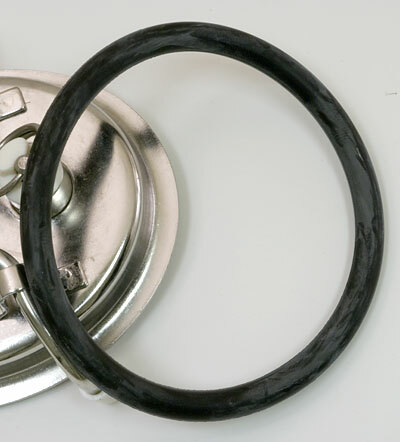 Fits all brands of kegs, pin-lock or ball-lock, with a 3 by 3.5” clamp down oval lid. Best for older lids, as new lids when installed on older kegs tend to have tighter tolerances, and a standard O ring (our part P92) works fine. Note: Pictured lid is not included. Fantastic product. A perfect fix for a couple of my older kegs that began to have slow lid leaks. I will certainly be purchasing more. from TN Oversize corny keg lid O ring. A face-lift that will extend the life of my kegs and save me money on CO2. Highly recommend. These gaskets are amazing and seal with no CO2 pressure. The only problem with the two I received was that they gave off an extremely strong sulphur smell when I sprayed them with Starsan (they were first cleaned with PBW). The smell went away after a 20 minute soak in Starsan. Apparently whatever chemical that was reacting with the Starsan was used up during the soak and they now give off no odor. I feel like this should be mentioned in the description so nobody ruins an entire keg of beer. This is a great product for folks using old, crappy equipment like me. Hate to throw things away if they can be fixed. These oversized seals are a great solution. I have been looking for over sized keg o-rings for a long time and found them at Williams Home Brewing. They are the answer to old kegs that are hard to seal. A few dollars for over sized o-rings is way better than buying new kegs!